Study with a CISI Premier Training Provider that consistently records higher pass rates than the national average. The Chartered Wealth Manager Qualification is recognised as the gold star qualification for private client wealth managers. This is why so many employers place such importance on recruiting individuals who are able to achieve this CISI standard. With the Chartered Wealth Manager exams only being held twice a year it is crucial that candidates provide themselves with the best opportunity to pass first time. The investment of time needed to complete all three Chartered Wealth Manager papers is substantial, which means that finding the right study support is imperative. This is why FSTP have designed an effective 8 day study programme that has produced excellent pass rates time and again. Our methodology and approach creates a learning environment more conducive to candidates passing their exams first time, reducing the costs and time spent on resitting exams. 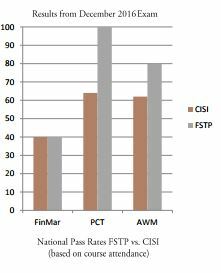 FSTP pass rates have consistently exceeded the national average over the last 3 years. To maintain the integrity of our offering we have limited availability and will allocate on a first come, first served basis, so booking early is recommended. Get valuable time with our expert trainers. You can schedule sessions at a wide range of locations. Or we can arrange for group sessions within your firm. including course materials, revision guides and past exam papers. you on exam technique best practice. hand. Or you can contact our administrative support for general enquiries. with the latest regulatory developments.